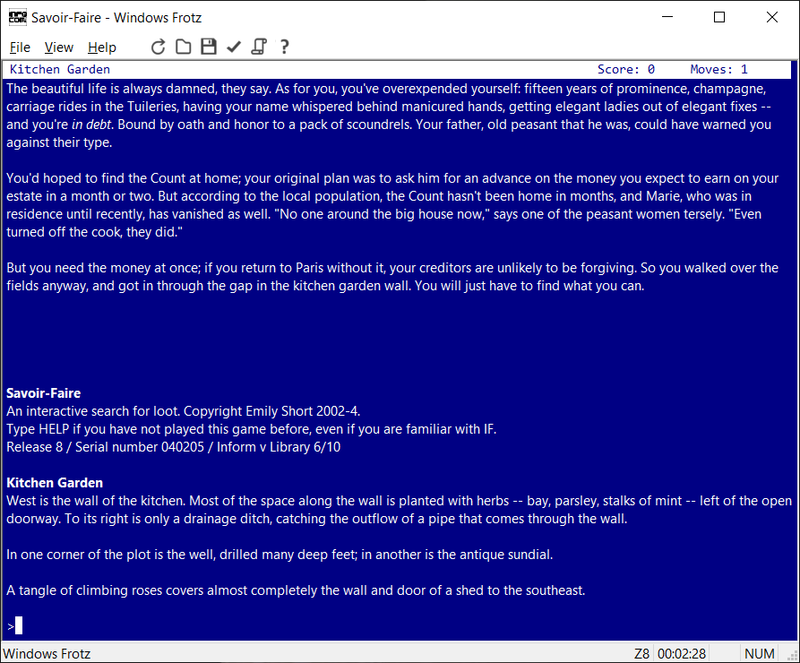 Windows Frotz is an interpreter that can play all the old Infocom text adventures. Infocom used a novel approach to write their games: they had a system that produced a data file for the adventure that was the same on every computer, and an interpreter for every computer that could run all the games (It was actually a bit more complicated than that, but that's the basic idea). During the late 1980s and early 1990s many people worked to decode Infocom's format, producing several interpreters for the format (which is called Z-code, or the Z-Machine, with the Z coming from Zork, Infocom's first game). Windows Frotz is the latest in this line of interpreters. During the early 1990s, Graham Nelson took the next step by writing a compiler for the format, called Inform. The result is that the modern text adventure community have written several hundred games in this format that can be played with this interpreter. The current version, Windows Frotz 1.20, can be downloaded from the IF-Archive, as can many games. (Also available are just the Windows Frotz files without the installer, and also the source code.) For ratings and descriptions of games you can play, search for Z-code games at IFDB. Frotz supports The Treaty of Babel, and can read game metadata in the iFiction format defined by the treaty. For an example of this, you can download a copy of Graham Nelson's Curses, packaged as a Blorb file with metadata and cover art.